The Haier 18 Bottle wine coolers (HVTEC18DABS, HVW18ABB) are tall, narrow wine refrigerators designed for freestanding use. They use thermoelectric cooling technology ensuring very quiet and vibration-free operation. The friendly price (sells for around US$ 150 – 230) of the two main models makes them a perfect soulution for wine enthusiasts with small budget and home. Read on to find out about the two units’ main features and specifiactions. 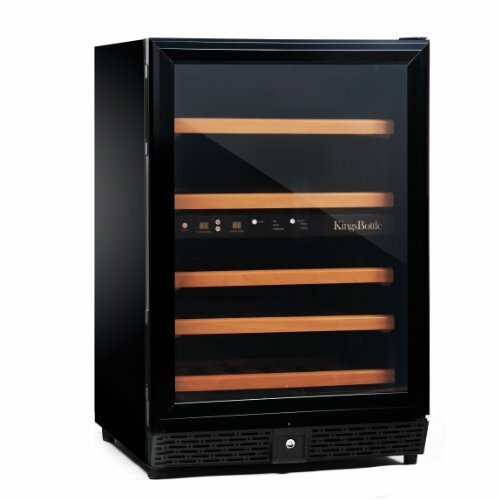 The Haier HVW18ABB wine cooler is a single temperature zone wine cabinet in which you can fit in up to 18 bottles of wine. The black cabinet with the black-trimmed, dual pane door looks modern and stylish that matches with nearly any home decor. The interior of the appliance is also black. The door has recessed handle providing easy grip when opening the door but without any protruding part making the unit even more fitting for those who are scrunched on space. 9 wire racks accommodate the bottles which can be pulled out so that you can easily pick and take out a wine. You can fit two bottles of champagne on one shelf if you place one with the cork inwards the other outwards. With the mechanical thermostat you can adjust a desired cooling temperature in the range of 50 – 64ºF. The unit works with thermoelectric cooling technique which uses semiconductors instead of a compressor. With no compressor the wine cooler emits less noise (only the fans driving out the hot air form the inside cause noise). This noise- and vibration-free environment is very favorable for storing wines because the sedimentation in it isn’t disturbed. Another advantage of thermal electric refrigerators is that they do not contain any chemical cooling agent (CFC-s, HCFC-s) so they have less impact on the environment at the end of their life cycle. Thermoelectric cooling however has its limitations. Thermoelectric coolers can ensure and maintain the set temperature in rooms where ambient tempearture is not higher than 70 – 72ºF. 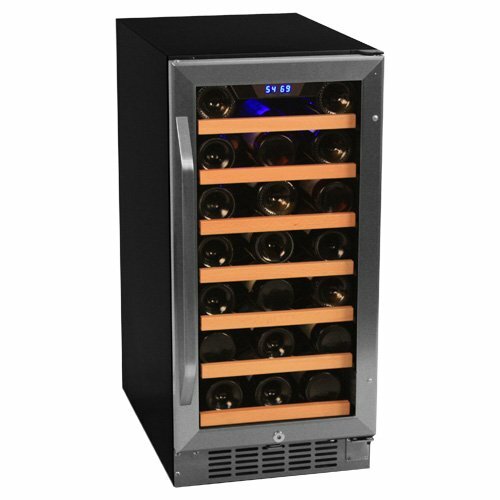 Find out more about thermoelectric wine refrigerators. With less than 12 inch width the 18-bottle Haier wine tower is a nice fit for narrow spaces although it’s for freestanding use only. Warranty: 1 year parts and labor (this is not too long but it’s standard in this price category). Some customers who bought this model have complained that it’s a bit noisy despite that there’s no compressor in the appliance. The reason for this might be that the wine cooler isn’t placed appropriately as described in its manual. The venting must be partially blocked so the fan works a lot to get rid off the hot air inside the cabinet. Make sure you leave enough clearance for proper ventillation otherwise the fan might break down in a very short time. Regarding noise some other customer said that the wine refrigerator generates only a slight buzz. 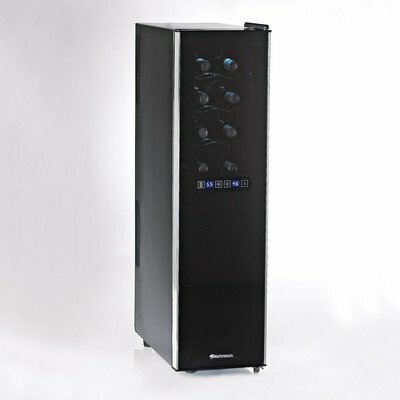 Other users of the Haier 18 bottle wine cooler love its compact look and haven’t find it noisy at all. All in all the the Haier 18 bottle wine cooler is a good-value appliance with nice look that provides proper storage environment for your wines. Mine died after 5 months, was very noisy, and would not cool to the proper temp. The quality of Haier wine coolers is very poor. I have owned 2 of them. Both died after a few months. Even before they died, they would not get cold and were noisy. Read more wine cooler refrigerator reviews submitted by users. 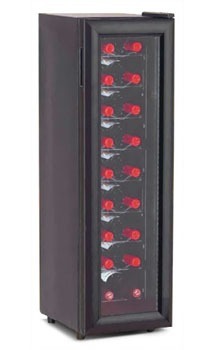 Avanti 16-bottle Dual Zone Wine Fridge. 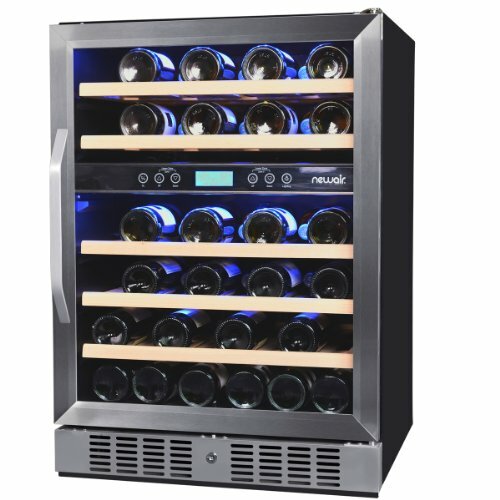 TIP: The Wine Enthusiast 18-Bottle Touchscreen Wine Cooler is a perfect alternative if you want a narrow, space saving model. 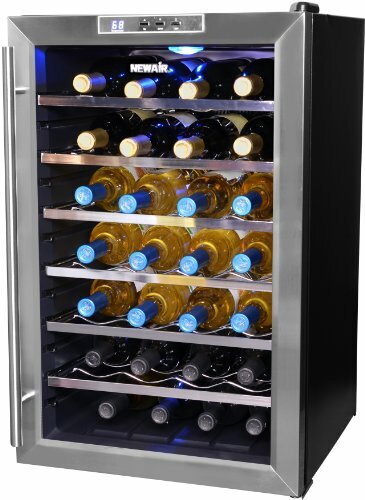 For other narrow wine refrigerators visit our page about Slim Wine Coolers. See other good-value cheap wine refrigerator models.